Discussion in 'Sevenstring Guitars' started by dualz0r, Apr 11, 2018. Hey guys, finally got this cool guitar to play, and i'd like to say it is awesome! Amazing and comfortable playability, pure evil sound and great look! Trashgreen, 77zark77, NickS and 12 others like this. Oh boy, now I gotta hide this GAS wood. That is pretty damn sick! HNGD, man, guitar looks sick. I've been gasing for an Edwards axe for quite some time now. Can you compare it to LTD 1000s, is it better quality? As of hardware, I'd bet on the Edwards, I think. The main problem is there is no way of getting to try one here, I mean, there isn't even official ESP/LTD dealer in town. How do you get them japanese axes up there? They seem really popular in Russia. Had a chance to get an EX-125 some time ago, but someone got there faster. Still sorry about it. Now I'm considering getting an E-HR-135. There s something in the simplicity of these models - no flags, abalone, 12th fret markers etc., really dig them. Even the black binding doesn't irritate me. Still afraid to order directly from Japan. 1. Edwards and LTD 1000s are pretty much the same quality, though it is manufactured in different contries, so the Japanese wood quality and sound is kinda better to my opinion. The hardware is almost the same, cause both brands put Gotoh (Japan made) in their guitars mainly. 2. Well, I got my guitar from eBay, the seller was located in Japan. No problems with the delivery. In Russia we got a lot of shops, who buy used Japan guitars and sell them here. U can get a well made 20 year old guitar for about 500$ in a really good state. 4. I really like how Edwards E-HR-135 NT looks, if U are talking about it, but I'm not really sure about SD black winter pickups, as to me, they got too much high frequency in the sound. I have always wanted this Edwards. 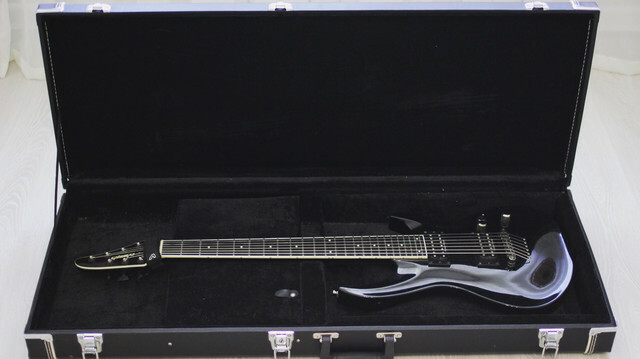 Just seems like the perfect 7 string 666 mm scale length for maximum trve kvlt. Seymour Duncan pickups. Just the dot inlays, radius and the import fees always turned me off. still, hoping for a used one to pop up.